Disclosure: I received this product for review purposes at no charge. Rather than jumping right into the product description as I typically do with e-cigarette reviews, I’m going to do something a little different and talk about how the Aviator Club thing works. Essentially, it’s a disposable e-cigarette of the month club. Or, to put it more in hip internet terms, Dollar Shave Club. You sign up for a membership and pay a certain amount to get a fixed number of disposable e-cigarettes delivered to you. Yes, I have to admit, I’m less than a big fan of autoship products. It’s too easy to forget to cancel (I’m subscribed to so many services I don’t need, it’s not even funny). Aviator seems to be pretty much on the up and up. They have everything spelled out in their terms. Essentially, you have to cancel by the first of the month and you’re good. If not, you’ll get one more month of disposables before the subscription ends. Pricing isn’t too bad, the lowest membership level starts at 25 bucks as of this writing which gives you a pack of 5 disposables per month. $5 per disposable isn’t a bad price. The per-unit pricing goes down with each higher teir with the highest one topping out at 3 packs of 5 disposables. Naturally, I imagine anyone would be hesitant to sign up for something like this without trying the product first. Thankfully, they’ve resisted the temptation to do a “free” trial that then ropes you into a subscription. Instead, they offer the “Test Flight” which is one each of their flavors for 10 dollars plus shipping. This is what the company, so let’s hit a quick review, shall we? 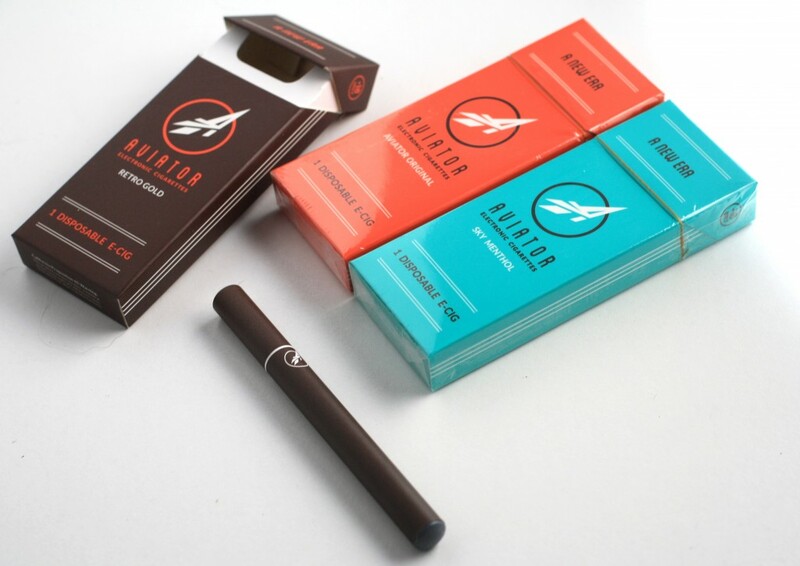 The test flight consists of three disposable e-cigarettes. Each model comes in its own slick packaging which looks like a miniature flip-top cigarette box. The flavors each come in their own colored box. Brown for retro, orange for original and green for menthol. Each box is tastefully done with instructions (really?) as well as a logo, and a few warnings. Printed in very tiny font is the ingredient listing which includes the nicotine level listed at 18 grams. It doesn’t specify the ratio, if that’s per ml or for the whole disposable which is probably a smidge above 1ml. I had a hard time actually finding the nicotine levels. I think it should be more prominent on the packaging and their website. I was not able to find a reference to nicotine levels on the website at all. Ok, that’s enough grousing for now, on to the actual e-cigarettes. 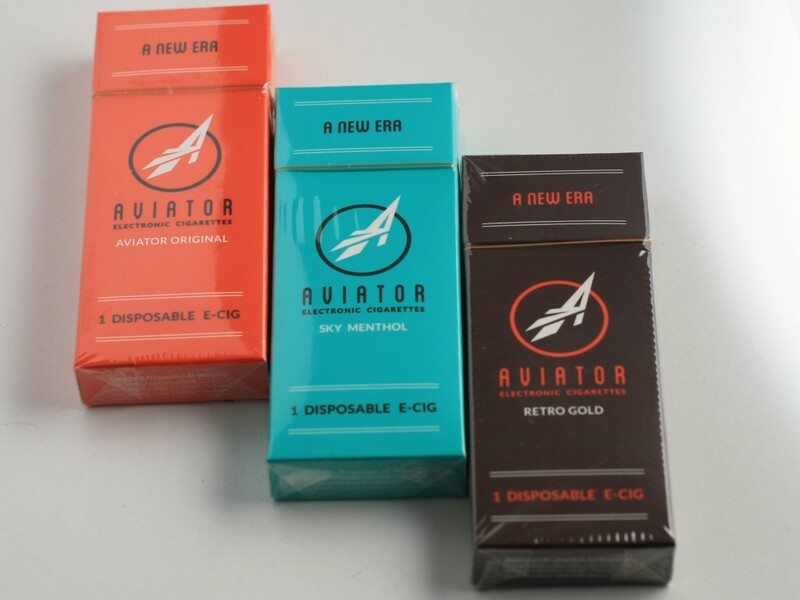 The Aviator disposable ecigs are fairly typical disposables. They have a squishy “filter” tip ala NJoy Kings. To be honest, I like to chew on these things, it’s a nervous habit I suppose. 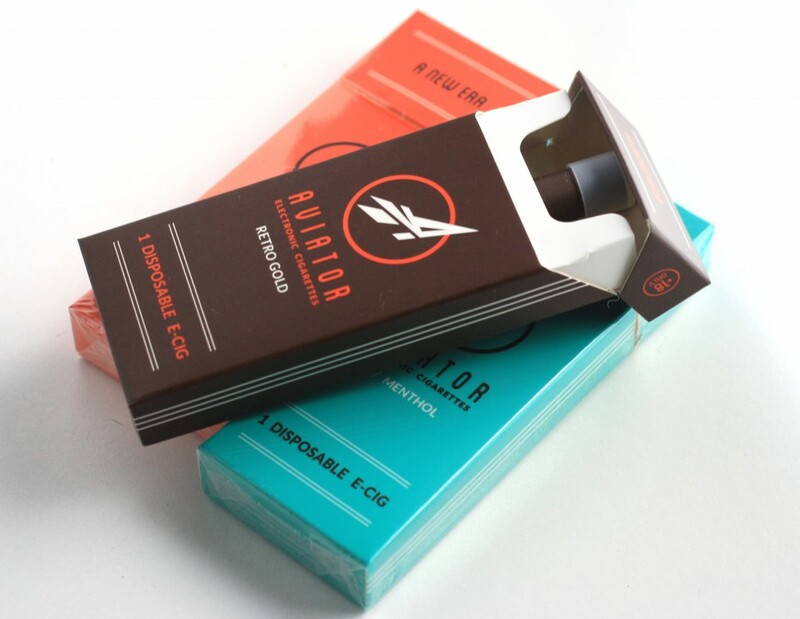 The entire unit is created with a flexible plastic outer shell to give its squishyness while the whole thing is wrapped in a very dark brown paper with the company’s logo in a color to indicate the flavor. The effect is a very sleek and streamlined appearance. Sadly, the tip is your typical orangered found on many low-end e-cigarette models. I’ve said it dozens of times, I’m just not a fan. Alright, enough about what these things look like, let’s talk what they’re like to vape. I tried both the retro and the original, but skipped the menthol. I’ve never been a menthol person, so I simply abstain. 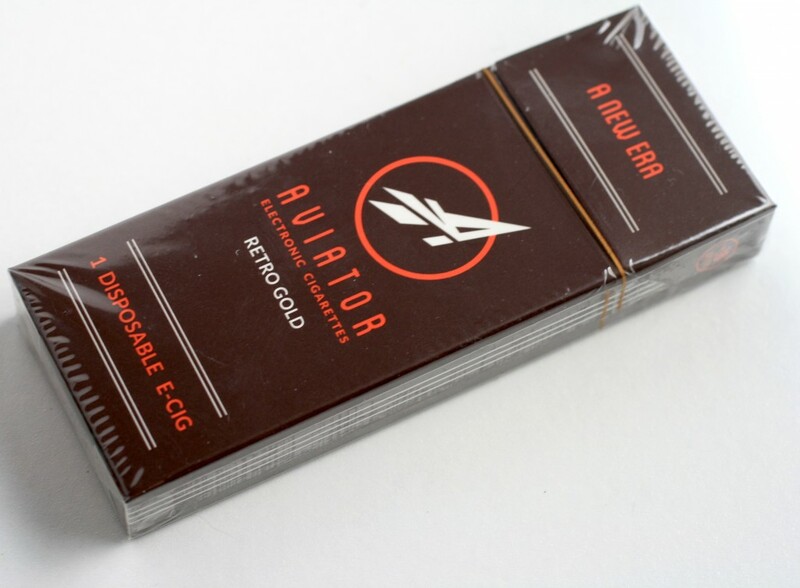 Of the two tobacco flavors, Retro Gold is more of a typical “tobacco” e-cigarette flavor. As such, I didn’t care much for it, but that really is more of a personal thing. The Original was a little more appealing to me. I’m still not a tobacco fan, but the Original had a little bit of mocha flavoring and was generally a little smoother than the retro. Perhaps a little too sweet, but in general I found it serviceable. Taking a puff on the ecig, I found the draw to be very nice. It had a smooth quality to it with just a light touch of resistance. The battery had no problem activating with even a slight puff (which you’d need to get the two pack equivalent claimed on the packaging). Vapor production was not disappointing at all. There was a nice amount of output on par with many of the better traditional e-cigarettes. Vapor production was a little on the cooler side. Flavor I covered earlier, and with no baseline for comparison, that one will have to be in the eye of the beholder. I guess I could sum it up by saying the Avator is a very good disposable electronic cigarette. I don’t know how many people are so dedicated to disposables, however, that they’d get a subscription. There are people who don’t want to mess around with all the trappings of vaping, so they would likely be the ideal market for this product. You can check out the subscription options or order a Test Flight at Aviator’s website.